And speaking of a good story…..
we were, last night. About big stories and good stories. Huh. That’s not a bad idea. I was impressed, not only that he’d been listening and thinking, but also that he had come up with a really good idea. I told him to go talk to our friend who is in charge of the packing of the bags right now. He’s growing up right before my very eyes. Sometimes I get growing pains it is happening so fast. Today in the car, Cooter and his sister had a long discussion about what would be good to put in the backpacks along with the food. Cooter was thinking coats, hats, and gloves in the winter. Bless him. Bless them both. This isn’t a big story. We haven’t solved world hunger. Or even hunger in our own community. We haven’t even been to the store yet to pick up food for the backpacks this week. But I think it’s a good story. One that I will hold close to my heart–especially when I am tempted to forget how giving and loving and thoughtful my children can be. Oh, like all of us, they have their moments when they most definitely are not. But this, their minds and hearts working in sync to see a need and try to address it? May we all take a moment to see how we can fill a hungry body, heart, or soul today. It can be as simple as a smile or picking up an extra can of healthy food or a bag of apples. Wishing you all good stories. Love to all. 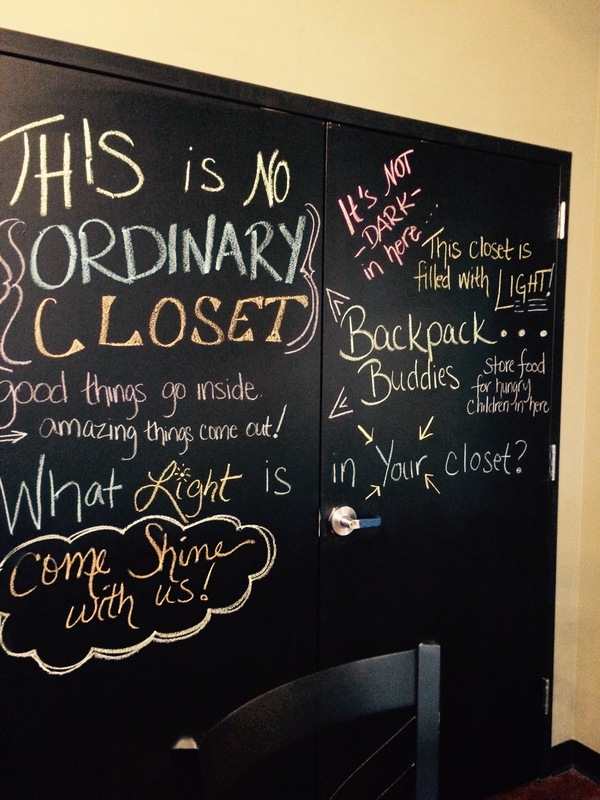 The closet where the Backpack Buddies magic happens. Thanks for helping fill it up. If you are one of my local friends and you have an extra minute and dollar or two, please consider dropping a non-perishable item in the purple bucket at Bare Bulb Coffee in Kathleen. (And get yourself a cup of coffee while you’re at it–it is literally the best coffee ever. And seriously, I know what I’m talking about.) Some of the things they can use are granola bars, instant mac’n’cheese, crackers, 100% fruit juice, fresh apples, fruit cups, and canned goods like Chef Boyardee or tuna. (They try to stay away from gummy snacks and sugary drinks and chips.) They are packing for 35 children every week right now, and your help will make a huge impact. Thanks y’all. Toothbrushes & paste,,great idea. maybe your dentist would even make a donation if they have free samples! Yes! Great idea. I think we are going to check in with a couple of different ones to see. Thanks for thinking of it and for reading.